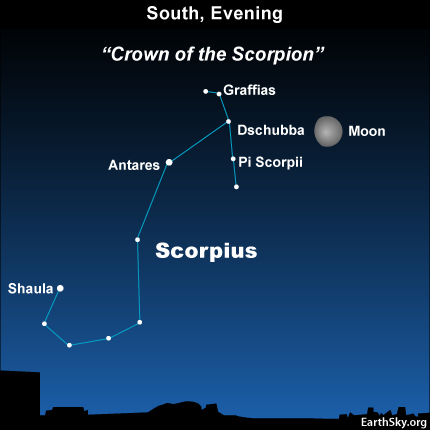 Tonight’s moon appears near the upper part of the constellation Scorpius. These three stars are sometimes called the Crown of the Scorpion. Scorpius – which now rises in the south-southeastern sky at early evening, is the constellation of the Scorpion. Individually, the Crown stars are Graffias, Dschubba, and Pi Scorpii. It is rare when star patterns on our sky’s dome have anything to do with real associations of stars in space, but these stars are thought to be loosely bound by gravity. All three are located at approximately the same distance, about 500 light-years away. All are thought to be members of the Scorpius-Centaurus group, which was first recognized by astronomers in the early part of this century. About 100 stars are known in the Scorpius-Centaurus group, including Antares, the brightest star in Scorpius – also pictured on today’s chart. For more about Antares, see tomorrow’s chart. The Scorpius-Centaurus stars share a common motion through space. They were probably all born from a single vast cloud of gas and dust. In other words, these stars are much like a family – loosely bound – sharing a common history. Site contents copyright © 2019 Recorder Online	except as noted. All rights reserved. | 88 queries in 2.599 seconds.